Every aspect of Winfrey's empire has the noble aim of helping women become inspired and improve themselves. Unfortunately, this mission has taken her — and by default, the nation — on a spiritual trek through the questionable theology of the New Age. After her star turn at the Golden Globes Sunday night, Oprah is the media darling once again - and the hope of America? Sue Bohlin blogged about Oprah's spirituality when her daily TV show ended. 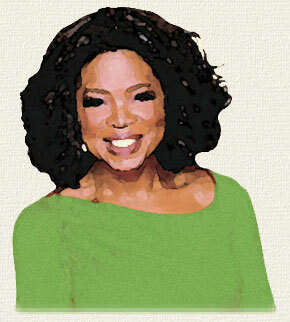 Tomorrow is the last episode of the Oprah Winfrey show on network TV. Oprah will be throwing her considerable energies and resources into her own cable network (OWN: The Oprah Winfrey Network). But she has left a huge footprint on the culture and on the hearts of minds of millions of loyal fans. People have said for years that they wished Oprah were their next door neighbor or their best friend. And for good reason: she is winsome. She is open and transparent. She is incredibly generous. She not only asks the questions you would ask of her guests, she has the power to draw some of the most powerful and influential people to her stage, ranging from U.S. presidents to Billy Graham. But she is so much more than a talk-show host. She sees herself as a teacher, and she certainly has used her pulpit to teach and preach - worldwide, as evidenced by the outpouring of love and attendance at her recent tour of Australia. The problem is that what she's teaching, both personally and through the spiritual gurus she has brought into the limelight, is poisonous. It not only keeps unbelievers in the dark, but she has the power to draw undiscerning, untaught Christians into her spiritual gravity field of heresy. Oprah is a false teacher of postmodern religion, an a la carte spirituality where people pick and choose their beliefs from a cafeteria line of offerings. She started out with a strong foundation in the Baptist church, but over time she drifted into unbiblical New Age beliefs. She mentions God a lot, but she defines Him in her own way. She has become a Christian-flavored pantheist, one who believes that an impersonal god, ("however you choose to describe him") is a universal force or energy. She embraces karmic destiny from Zen Buddhism. One of Oprah's buddies is Marianne Williamson, a teacher of A Course in Miracles. In 2008, on her XM Satellite Radio show "Oprah and Friends," listeners were offered a year-long course of study on this book which was channeled from a demon. At the same time, she and author Eckhard Tolle offered a webinar featuring his book A New Earth: Awakening to Your Life's Purpose. This book is Eastern mysticism, which is incompatible with biblical Christianity, but many Christians can't tell the difference. "I've reconciled it because I was able to open my mind about the absolute indescribable hugeness of that which we call ‘God.' I took God out of the box because I grew up in the Baptist church and there were, you know, rules and, you know, belief systems indoctrined. And I happened to be sitting in church in my late twenties . . . And this great minister was preaching about how great God was and how omniscient and omnipresent, and God is everything. And then he said, ‘And the Lord thy God is a jealous God.' And I was, you know, caught up in the rapture of that moment until he said 'jealous.' And something struck me. I was thinking God is all, God is omnipresent, God is - and God's also jealous? God is jealous of me? And something about that didn't feel right in my spirit because I believe that God is love and that God is in all things. And so that's when the search for something more than doctrine started to stir within me. "And you know, it's been a journey to get to the place where I understand, that what I believe is that Jesus came to show us Christ consciousness. That Jesus came to show us the way of the heart and that what Jesus was saying that to show us the higher consciousness that we're all talking about here. Jesus came to say, ‘Look I'm going to live in the body, in the human body and I'm going to show you how it's done.' These are some principles and some laws that you can use to live by to know that way. And when I started to recognize that, that Jesus didn't come in my belief, even as a Christian, I don't believe that Jesus came to start Christianity. So that was also very helpful to me. "Well, I am a Christian who believes that there are certainly many more paths to God other than Christianity." Jesus said, "I am the way, the truth and the life. No man comes to the Father except through Me" (John 14:6). That's either true, or it's false. And not even "the divine Miss O" can get around that. Please join me in praying that she will return to the Lord of truth - and please stay discerning about anything and everything Oprah says. If God doesn't agree with it, it's false. And it's dangerous. In the hour-long sermon of her farewell show, Oprah was consistent with her values and her perception of herself as teacher. It was filled with her inspirational "you can do it" rhetoric that has endeared her to us for 25 years. She did address the spirituality issue. She said that when people ask how she lasted, how she did it for 25 years, she answers, "My team - and Jesus." She added, "Nothing but the hand of God has made it possible." Her life is permeated by awareness of God's presence and grace in her life, but she has been deceived by the lies of the enemy. She said, "People want to know, which God are you talkin' about? The same one you're talkin' about: the alpha and omega, the omniscient, the omnipresent, the ultimate consciousness, the source, the force, the all of everything there is, the one and only Gee Oh Dee. That's the one I'm talkin' about." This description of her God is a combination of the biblical God (alpha and omega, omniscient, omnipresent) and the impersonal divinity of pantheism (the source, the force, the all of everything there is). Note that "the one and only Gee Oh Dee" is not the way God reveals Himself to us in His word - as Father, Son and Spirit. Oprah invokes her memory of Jesus as a warm and fuzzy throwback to her childhood, like a beloved teddy bear that you love but keep on the shelf as a reminder of younger days. She's not dealing with the Jesus who insisted He is the only way to the Father! As I mentioned in my blog post, Oprah's point of departure from orthodoxy was hearing in church, "The Lord thy God is a jealous God." Instead of checking her reaction to this statement with a pastor or someone more theologically taught then she, Oprah slammed the door on the fundamentals of Christianity and gave herself permission to pursue a god more to her taste. What a difference it would have made if she had allowed someone to assure her, "No, Oprah, God is not jealous of you. He is jealous for you! He loves you so much, He wants your full and undivided heart. Let go of your misunderstanding and embrace the Father who loves you more than you can imagine." Instead, she has embraced a vague and impersonal divinity who is indistinguishable from the universe. In fact, one of the prayers of her life has been, "What would You - God - the universe - have me do?" The problem with this is that God and the universe are not the same thing. God is the creator of the universe. He is before, above, and outside the universe. The universe is part of His creation. There is no point in asking a part of creation what it would have her do, because the universe is a fellow creature of the Most High God along with Oprah. Much has been made of her farewell words, "Until we meet again." But those were not her last words. The final words of her finale were, "To God be the glory." And I truly do think she means it. I think that Oprah is not evil, she's deceived. And I will continue to pray for her. 1. John Piper, "The All-Providing King Who Would Not Be King," www.desiringgod.org/resource-library/sermons/the-all-providing-king-who-would-not-be-king. "There are times, though perhaps not many, when even the Queen of Talk is at a loss for words, when her lively brand of armchair wisdom collapses under the weight of personal revelation. Oprah Winfrey calls these her "go there" moments, spiritual episodes of divine guidance that far transcend the chatty exchanges with her studio audiences - about her fiancé Stedman, her best friend Gayle or even her dogs Sophie and Solomon - that often masquerade as intimacy. It is during these moments, usually while jogging the winding trails on her Indiana farm, that Winfrey becomes overwhelmed by the sense that old spirits are trying to get in touch with her. And it is during these moments that the woman who loves to talk stops dead in her tracks simply to listen.